The great holiday was last night in several places from the Capital. 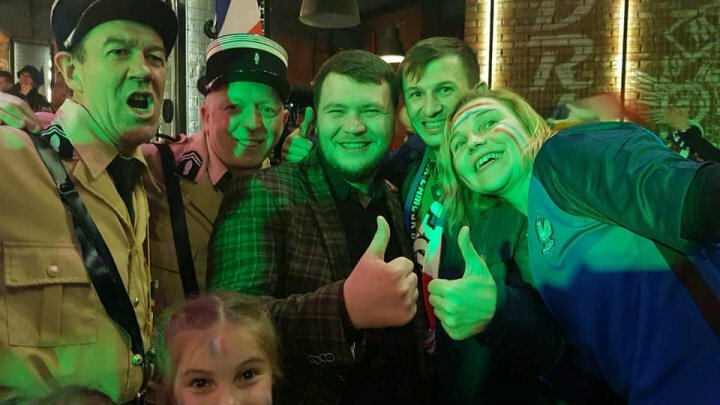 Directly from the stadium, most of the French supporters went to celebrate the victory of the favorite team in a locality in Chisinau, which was dedicated exclusively to the fans "Le blues" throughout the game. After the final whistle of the game, the joy of the French was shared by the Moldavian fans, who, despite the defeat, came to chef and enjoy the goal scored in the world championship. The goal scored by the Moldavian footballers at the end of the match in the world champions' tournament, brought to light the over 10 thousand supporters in the stands. At that point, the fact that our team lost to the fanciers does not matter much. The goal of honor in the world championship gates was a real gift for Moldovan fans. "Our Moldovans have kept their heads up". "They thought we were going to be afraid, so we were loyal at last". Matthew was one of the lucky few who stepped yesterday on the pitch with the footballers. He accompanied the captain of the Moldovan national team, Artur Ionita. And the French supporters left the arena with joy. They quickly celebrated the victory of the favorite team.". Great fun continued after the game. "It was beautiful, Mbappe, Griezmann, Giroud, Varane, four goals! "It was a game not too complicated for us. We are sorry for the Moldova team, which was hard on the match against France, because our team is more experienced". The Le Blanc fans appreciated both the performance of the tricolor and the Zimbru stadium. "It was a beautiful atmosphere. We are proud of our team, but the Moldavian side has also made a good game". After the match, the club opened its doors for Moldovan fans, who had fun with the French supporters. Especially because they had reason. "Moldova finally scored, really scored, really. I'm really glad that we were at home at the level with the world champion". Over 200 Moldavian and French fans fired until the morning.